This delicious recipe goes back to another era, back to Sunday Mass at St. Casimir’s in Lansing MI, when I was 8 or 9 and each week mom and dad dragged us in our Sunday best to the 8 or 9 am mass, about which I most remember kneeling for extended periods with my head buried in my clasped hands on the pew, thinking about playing baseball or slot cars. The only “redemption” from that experience was the batch of sour-milk pancakes my mom often whipped up afterwards. I liked them so much that after a while I began to help her, and eventually took over the Sunday morning cooking duties. 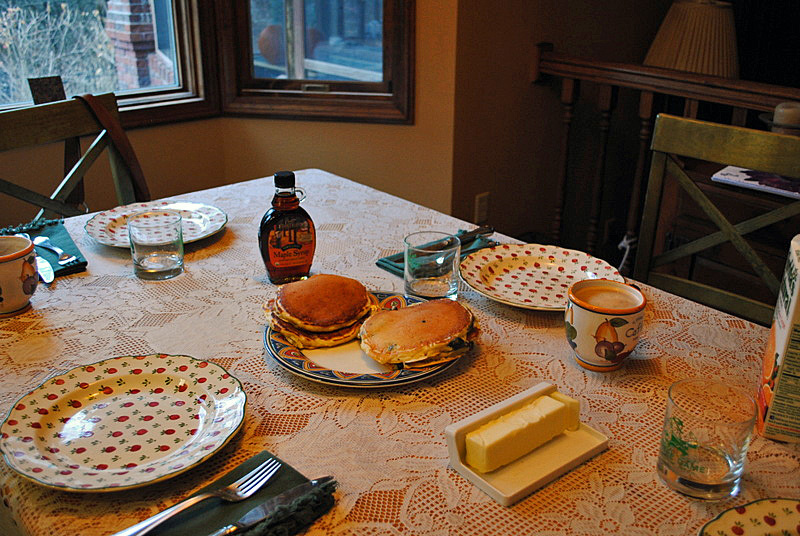 Since then I made these pancakes for my housemates, girlfriends, wife, siblings, sons and visitors to our home. They are so simple that I never forgot them. The key component is a now seldom-used or seen ingredient, sour milk. In those days it was easy to come by, probably from less efficient pasteurization or fewer preservatives. But, you can still let a quart of milk go sour, or you can buy a quart of buttermilk, an adequate substitute. 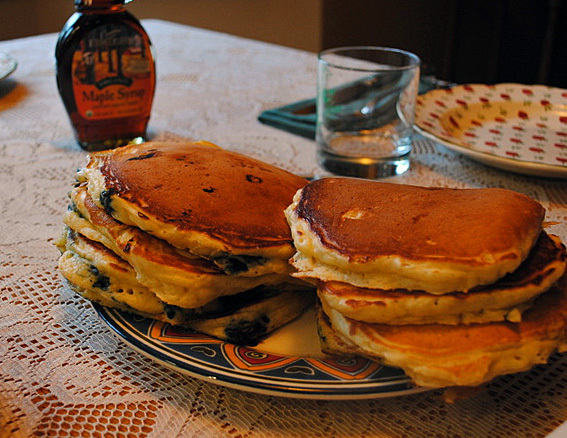 Of course, I try to make them in a way that duplicates my mom’s, and also my grandma’s and aunt Mildred’s pancakes. The recipe became so popular in our family that everyone from Detroit to Chicago knew it, and they both made them for us when they visited. However, because they all departed this world before I thought to question them about their excellent techniques, my recipe has a few of my own modifications. I’m still wondering why my grandma’s rose less during the cooking. I’m working on that. 1. 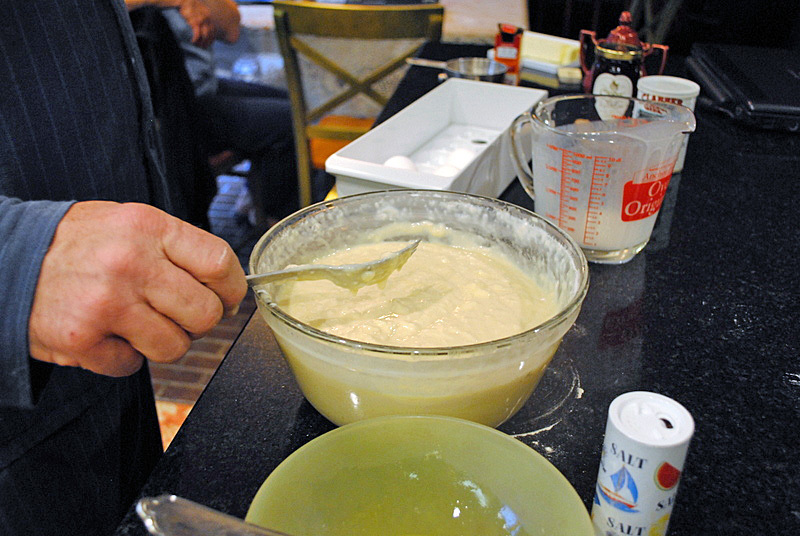 In a large bowl cream 1 T butter, 2 T sugar, ½ t salt. 2. Beat in 1 large (or extra-large / jumbo) egg. 3. To the flour (cake, unbleached, whole-wheat, buckwheat or my favorite: half unbleached/half whole-wheat flour) mix in ½ t baking powder; add it to the egg mixture. 4. To 1 cup sour milk (or buttermilk) in a 2-cup measuring container add ½ t baking soda; whip by hand with a fork until the sound deepens when the milk thickens; add to the batch and fold until fully mixed. 5. Rub a gas or electric griddle (at 375 F) with a small tab of butter on a paper towel. Use an ice-cream scoop to deposit the pancakes; sprinkle in blueberries if you like; cook until the bubbles pop and then flip them for a couple of minutes. 6. Splurge and serve with real maple syrup. No need to butter them. 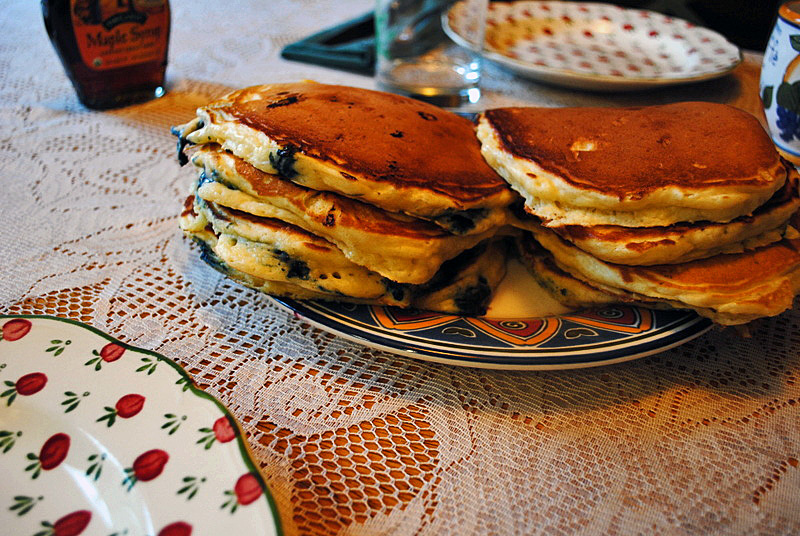 Skip the blueberries on half the batch and top a couple of pancakes with eggs fried over-easy…that’s breakfast, baby.